Sam Button-Harrison, Nicholas Stockwell, and Kyrie Anderson have been cast as the leads in Leo Schwartz’s musical Under A Rainbow Flag. Based on the real-life story of a WWII naval corpsman (who still lives in Evanston, Illinois), Under A Rainbow Flagis an upbeat work about a group of soldiers who meet on a transport train heading west from Chicago and about the choices they make during and after the war. Phillips (Sam Button-Harrison) meets Gibbs (Nicholas Stockwell), Russell (James Nedrud), and Stefano (Jordan Phelps) on the train. Stefano is an army surgeon headed to the Pacific theater, while Russell is an auto mechanic stationed stateside. Phillips loses his heart to Gibbs. But Gibbs has met a woman (Kyrie Anderson) who has plans of her own. Schwartz’ script, full of humor and surprise, explores all types of friendship and love – with their satisfactions and heartbreak. 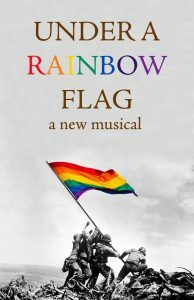 Under a Rainbow Flag will run March 23 to April 21 at the Main Stage, at 4139 North Broadway, Chicago. Previews are Friday and Saturday, March 21 and 22 at 7:30; tickets for previews are $15. Opening night is Saturday, March 23 at 7:30. Performances thereafter are Thursday, Friday and Saturday at 7:30 and Sunday at 2:30 through April 21. There are also 7:30 Wednesday performances on April 3, 10, and 17. Tickets are $20 on Wednesday and Thursday, and $25 on Friday, Saturday, and Sunday, and are available at www.brownpapertickets.com. Tickets can be purchased over the phone at 1800 838 3006. Discounts are available for veterans, students, and seniors. Under A Rainbow Flag is directed by PFP’s Executive Director David Zak, with musical direction by Robert Ollis. Scenic design is by Randy Buehler, lights by Garvin Jellison, costumes by John Nasca, and choreography by Tracy Strimple. Others in the 10-person cast include Pride Films and Plays Artistic Ensemble Members Kevin Webb, David Besky, and Kris Hyland, along with Donterrio Johnson and Bobby Arnold. Under A Rainbow Flag completes PFP’s first full Jeff-eligible season, which included the world premiere of At the Flash by Sean Chandler and David Leeper, and the 20th anniversary revival of Jonathan Harvey’s Beautiful Thing, which runs January 17 through February 17 at the Athenaeum Theatre, 2936 N. Southport in Chicago. About Pride Films and Play PFP’s mission is to develop professional-caliber stage plays and screenplays. To date, two dozen authors have come to Chicago for developmental workshops of their writing with PFP’s Artistic Ensemble of actors and directors. The workshops culminate in enhanced staged readings during festivals hosted by PFP’s sponsor, Center on Halsted. PFP has also provided more than $20,000 in contest winnings to authors around the world over the last two years. Entries for the 2013 Great Gay Play and Musical Contest were accepted by PFP from August 15 to October 16, 2012. The five finalists will be judged by a panel of professionals including Artistic Directors from around the country, and they will be performed as enhanced staged readings in Gay Play Weekend May 16 to 19, 2013 at Center on Halsted. Finally, PFP’s program for women writers – Women’s Work – will accept entries in spring 2013 for stage and screen works written by women that feature lesbian characters or themes. The finalists in that program will be performed as enhanced staged readings during Women’s Work Weekend in summer 2013. For more information on PFP Productions and Development Programs, including the writing contests, please visit www.pridefilmsandplays.com.